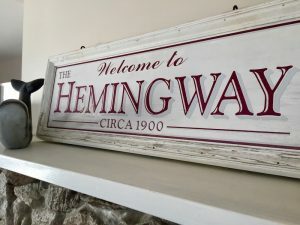 The Hemingway House is a three-season writer’s retreat and summer vacation rental in Onset. In our 2017 edition, we featured it in our Buzz section. You can see that here. But we wanted to know more. 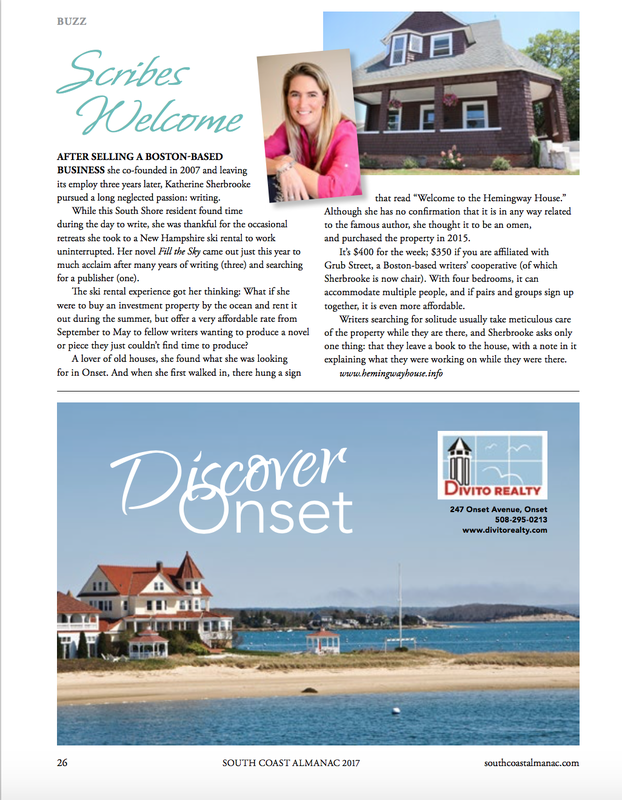 We asked owner Kathy Sherbrooke—author of the family memoir Finding Home and the novel Fill The Sky—to tell us a little about the house…. Kathy, first of all, why do this at all? Why go in search of a writer’s retreat? When I was writing my first novel, I reached a point when I desperately needed to get away by myself to do nothing but write. I went to New Hampshire for several days in the middle of a winter week and did nothing but write, take walks in the snow, and write some more. I was totally unencumbered—no one to look after, no standard meal times or sleeping hours, no conversation! It was magical. A lot of writing retreats seem to have very long lead times or expect authors to come for a month or more at a time. For a week-long stay, renting a decent hotel room or small house can be prohibitively expensive. At the time I had been considering making a real estate investment, and I realized that the two could be a perfect combination. It just clicked. You renovated Hemingway House specifically to meet the needs of writers. What makes the space work? 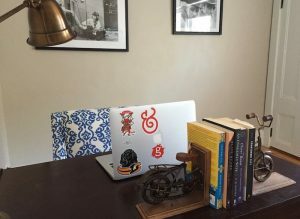 Everyone works differently, so the house has multiple writing spaces— various desks, a dining room table, a kitchen nook, and my favorite spot, a big comfy chaise in an alcove in one of the bedrooms. I also felt it was important to make the space feel warm and welcoming without being cluttered. A blue door, a colorful quilt or a beautiful print on the wall goes a long way to give the place its particular personality. And of course, bookshelves were a must! You’re a writer so you must have specific thoughts about the role of inspiration in the creative process. Do you think there’s something special about Hemingway House and Onset that might act as a muse for writers? I am greatly influenced by the atmosphere of the spaces in which I choose to write, and I think it’s hard to beat the atmosphere of an old house. This one was built in 1904 and has crooked floors and a claw foot tub to prove it. 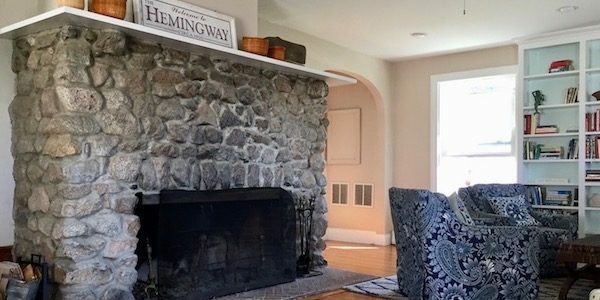 I took one look at the huge fieldstone fireplace and immediately wanted to sit in front of it with a book, or pull out my laptop and get writing. Of course, the fact that the house was previously owned by a series of Hemingways added to the charm. Whether that one particular Hemingway had ever been there, I don’t know. But I let my imagination run wild. There are writing retreats in the woods and mountains. Did you ever look anyplace other than the sea for a retreat? I knew I wanted this house to be near the water, but I would love to have another in Vermont or somewhere like that! I find walking a long wooded path or looking out onto a mountain range to be very inspiring. I actually think about that quite a bit. Fiction, non-fiction, poetry, screenplays? Any preference for you about what your guests are writing? All kinds of creative writing is welcome at the house. What’s important is that the writer have a clear sense of what they’d like to accomplish with their time. I admit that I have turned away a few academics who were looking to complete a white paper or thesis. While that is valuable work, it is not the kind of writing the house was intended to support. How much interaction do you have with writers while they’re at Hemingway House? Very little. Correspondence is usually via email, including instructions that allow access without me having to be there. I have had the pleasure of meeting several people who have stayed at the house after the fact, however, which is always great fun for me. We’re fans of the acknowledgements page in books. Do you secretly or not-so-secretly hope Hemingway House makes the cut and ends up playing a major role in a writer’s work? I’m a great fan of acknowledgement pages, too! Strangely though, that thought had not occurred to me until you asked. I suppose were someone impacted by their stay enough to include it, that would be a great honor and further validate the need for such a place. As for living authors, Geraldine Brooks is one of my all-time favorites. Having her write at the house and fill it with her creative energy would be pretty incredible. And Wallace Stegner would be pretty hard to beat. That would give the house quite a legacy. Honestly, my greatest hope from the beginning was to have the retreat offer that spark of inspiration or encouragement to an aspiring writer, perhaps someone feeling frustrated or stuck or questioning their sanity in trying to create art through words. If, after a week at Hemingway House, that writer has renewed confidence in their work and can press on to eventually put something fantastic out into the world, that would be amazing. Writers who stay at Hemingway House are asked to leave a book behind. Where did that idea originate and what’s the collection like now? 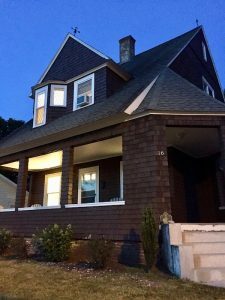 When I was putting the house together, I sought advice from Christopher Castellani, the Artistic Director of GrubStreet in Boston, where I take writing classes and sit on the Board of Directors. Chris has visited many writing retreats and told me about one that asked visitors to sign a plaque on the wall of their room. He was inspired by seeing the names of those who had written in the same spot before him, and suggested I consider a similar tradition. Signing a book struck me as something that made sense. The collection now has about fifty books (and counting!) and is quite eclectic, including many books written by the visitors themselves. I always look forward to seeing what has been left behind. Tell us some of your favorite spots around Onset that you recommend Hemingway House guests visit. I mean, even the most prolific writers have to take a break. Yes! Breaks are critical to an effective (and sustainable) retreat! I love to get outside and walk as my break from writing. Onset has a gorgeous horseshoe-shaped beach that is a great place to stroll. The park above the beach has a few benches that look out over the bay if still contemplation is more your thing. There is also a wonderful bike path that runs along the canal, which is perfect for a long-distance run or ride. If you are looking for an indoor break, I am a big fan of the Stonebridge Bar and Grill on East Boulevard. The staff is really friendly, they have a great menu, a full bar inside and a great deck outside that sits on an inlet. Onset also has two new coffee shops, one called Dog Days Coffee, which donates some of their profits to help dogs who serve in the military get back home. Visitors to the house will quickly surmise that I love dogs, so I’m fond of that spot. Thanks, Kathy, for your time. And, more importantly, thank you for creating this wonderful space for writers! Hemingway House is just one of the South Coast’s hidden jewels that help spark creativity and art. 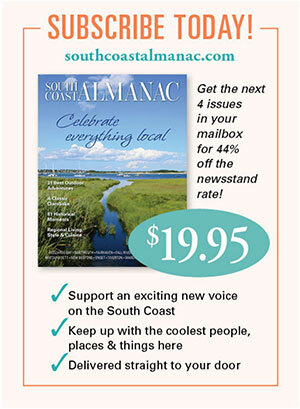 If you want to learn more about the treasures of the South Coast, sign up here for occasional email updates about our posts. For more on Hemingway House and to inquire about the retreat, check this out here. 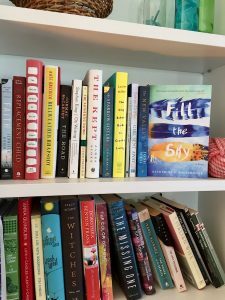 To learn more about Kathy and the story behind her novel, Fill the Sky, about three long-time friends who venture to Ecuador in search of healing and answers, check this out. This entry was posted in Books, Uncategorized and tagged in books, South Coast arts, writer's retreat, writers' retreats, writing, writing retreat, writing retreats.